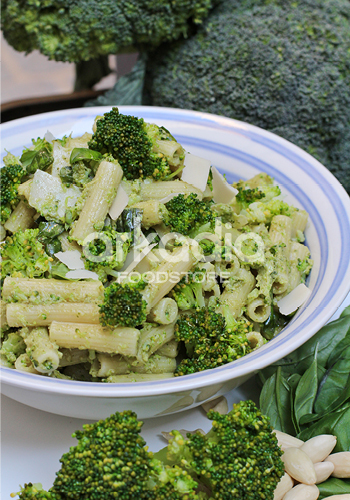 This is nice pasta recipe for those who crave for a bit of pasta but with a healthy twist. The following recipe can also be modified to your liking. Why not add in some salmon or chicken? It’s your kitchen and it is you who decided what goes on the plate. Give it a try sooner than later. Use leftover cooked broccoli if you have it, if not, steam or boil a whole head of broccoli for this recipe. In a clean pan, toast slightly the almonds and cool. In a food processor, whizz the almonds till very fine. Add the remaining ingredients to make the pesto. Blend until even. Boil the pasta according to pack instructions. Meanwhile cook the chopped garlic and anchovies in some olive oil. Toss the pasta in the garlic and anchovy. pepper and add heaped spoonfuls of broccoli pesto and toss all together. Add more parmesan cheese and bits of roughly chopped basil leaves and serve warm or cold. The remaining pesto can be frozen and used later.